Republicanism…really, what does that mean today? What does it actually stand for? Reducing the debt, patriotism, less government intervention into private lives, less taxes and working for “we the people” are all exempt in the current GOP lot; no matter how we might be inclined to sublimely think. No sir and ma’am included, ya can no longer attribute these ideas into the Republican platform. Since the Carter years to now, Democrat presidencies in reference to the national debt, on average have increased the debt as a percentage of GDP 4.2%. 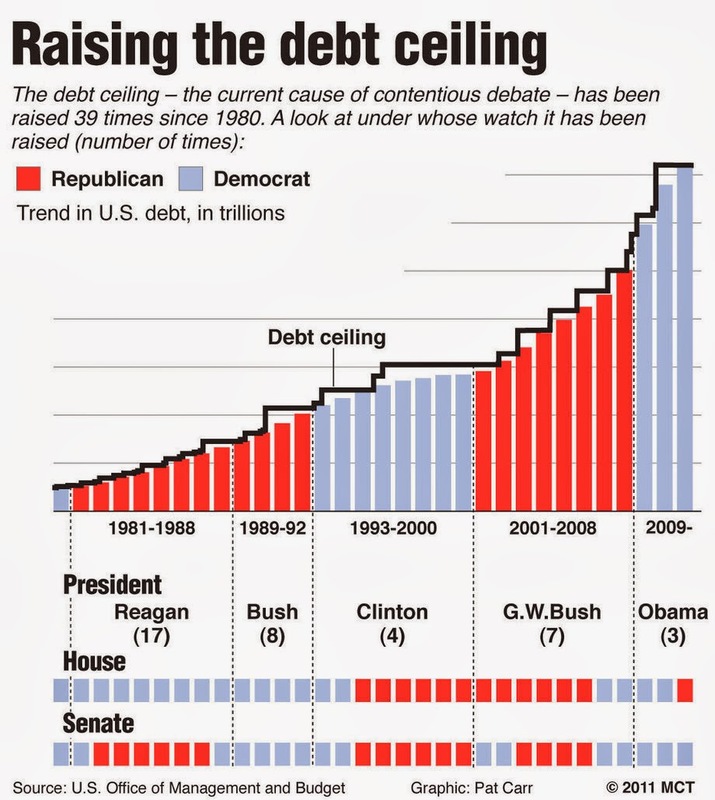 On the other hand, in that same time period, Republican administrations have rung up the debt bill a mountainous 36.4%. During Reagan’s two consecutive terms alone, he tripled the budget he inherited from Carter…the first and only time ever a president has done so. Do we even need to mention W. Bush who increased national debt by 16%, which doesn’t even include the Afghanistan/Iraqi war debts as the Bush administration excluded them from the national budget; took them right off the books. The two war debts have been climbing on average per hour with Afghanistan since 2001 at $10.45 million and Iraq since 2003 at $824,328.00. You did read that right…these are hourly figures. The only reason the Iraqi debt is now lower is that we are no longer militarily engaged there, although it is still costing us. The total Iraqi invasion from 2003-2010 is $1.7 trillion and that’s not counting accrued interests from foreign borrowing that may well reach $4 trillion and the $480 billion in benefits owed to veterans. Together, the two wars, just in military defense spending alone, currently have cost the nation $1,478 billion. President Clinton amassed a debt of $1.4 trillion during his two terms; W. Bush amassed a whopping $6.1 trillion, while during Obama’s time in office of five years has accrued a $2.4 trillion debt. At the end of Carter’s one term, the gross national debt, compared to the GDP (which shows how supposedly rich we are) was just below 35% at its lowest level since 1931. Then enters Reagan and once he took office, it skyrocketed for twelve years under Reaganomics during the terms of Reagan and H.W. Bush to 67%. By paying down national debt, Clinton reversed the upward Reaganomics trend to 57%. Now since both of W. Bush’s terms, the gross national debt has gone back to previous Republican levels, increasing to 69%. As of April of this year, Obama has raised the gross national debt 6 percentage points to 75%. That appears high, but still Obama is on par to lower that and even if he didn’t, once averaged for his remaining three years, it would still be lower than W. Bush’s final 69%...a climb of 12 percentage points. Also, let’s put this all in perspective. Bush inherited a post-cold war, an over quarter trillion dollar surplus that he turned around into a trillion dollar deficiency within his first year in office. The nation was at its zenith in might, prestige, wealth and a 4% unemployment rate. In turn, Obama inherited from W. a first time ever trillion dollar deficit of $1.4 trillion, a nation hemorrhaging 800,000 jobs/month with a 9.4% unemployment rate and climbing during Bush’s final fiscal year month. Above all, lest we not forget that when Bush handed the baton over to Obama, an event called the ‘Great Recession’ was unfolding causing the worst financial crisis collapse the nation has ever experienced, reeling the country into economic despair, along with corporate bankruptcies and financial failures. Regardless of the baton exchange’s dire situation, Obama managed more private sector job employment in his first eighteen months in office than Bush did his entire eight years. Within Obama’s first year in office, he halted unemployment’s upward trending and brought it down from -800,000 to -35,000. And last but not least, where W. kept the war costs off the books…Obama reinstated them into the federal budget, therefore inheriting much more debt than what he actually has accumulated. 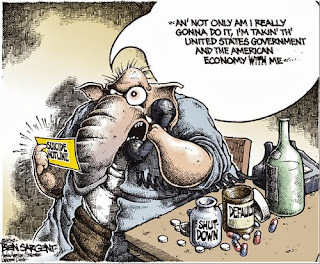 One would think that if Republicans spent more, then productivity would be more, but that is errant in thinking. During that same time frame, Democrat presidents’ GDP increased 12.6%, while Republicans only increased 9.8%. The economic growth under Reagan and H.W. Bush’s presidency was due mostly to federal subsidizing and not in private sector job hires. Debt, when concerning the federal budget refers to all the accumulated money borrowed by the U.S. government versus what amount it has paid back. The national deficit is the total amount the government spends over and beyond its budget within a single year. So, the deficit figure is more formidable. In raising the federal deficit through government spending, the Democrats between Carter’s final 2 years and 2006 increased federal spending 9.9%, while Republican presidents spent 12.88% in that same time frame. In inflation adjusted dollars for current 2013, since 2007 to present Bush showed the all-time high in raising the federal deficit through spending at $3,772 billion with a surplus deficit of -1,515 billion dollars. Obama has currently dropped that down to $3,455 billion with a surplus deficit of -645 million dollars. No matter how Republicans downplay the role of W. Bush’s administration along with the 111th Republican majority congress, their policies are the main actions responsible for the amassed debt and deficits that will be an harbinger for the U.S. to contend with until at least 2020. The Republican self-induced recession caused a major sharp deterioration in budget outlook and along with two wars that couldn’t be paid for due to the wealthy tax cuts drying up revenue. 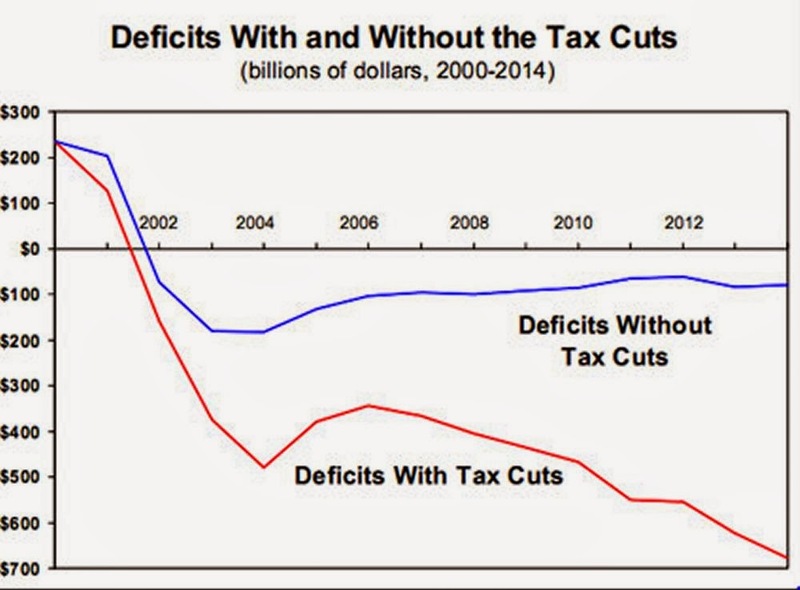 The Bush era tax cuts continue to grow the deficit in later years even after the huge economic downturn’s deficits have been eliminated by the Obama administration. Cheney stated this to O’Neil after the treasury secretary’s protest on another wealthy tax break with already shriveling federal revenue, during the second Bush tax cuts. That’s right folks, there was more than one Bush tax cut and all were geared for the already monetarily endowed. The first one, where all the working class Joe ‘n’ Jane’s got a onetime $300.00 tax return…the wealthy among us got one, got two, then got one more making three. In camouflaging the true nature of Bush’s rich tax cuts the Republican congress went out in public touting it, enlisting the first 2001 tax cut as “targeted’ inferring it was only for the middleclass when in actuality one-third of the breaks went to the richest one percent of the population. For the second act in 2003, Republicans touted this one (which only benefitted the rich) as a “sunset” tax break implying its provision would be professed as only temporary. The third and final “supply-side” wealthy tax cut, regarding a built up advocacy for tax relief occurred in 2004. Included within the rich Bush tax breaks was a repeal of the estate tax for the wealthiest 1% of the population. Under Republican House bill HR 8’s provision and the Bush administration’s plan, the estate tax was also repealed for one year with the strategy it would never be taken off once repeal was enacted into law. Later, an amendment to HR 8 was attached pushing the repeal of the estate tax break to 2011. All told, the 2001 tax break would cause a loss in federal revenues of $800 billion, the 2003…$1 trillion, the 2004…~$200 billion and the estate tax break would reduce revenues by $186 billion. According to the ‘Joint Committee on Taxation’ (JCT) who compiled these figures, the total lost in U.S. revenues would be well over $2 trillion. Some of the revenue lost was to be gained back by expanding down the Alternative Minimum Tax (AMT) to those making $100.000.00 and adding a percentile extra tax upwards from those making $51,500.00 dollars up to $75,600.00. All taxpayers below $51,500.00 earnings would not pay extra taxes, but also received the lowest initial tax break of 4.8%, which was about forty percent of all taxpayers. The poorest taxpayers making up 20% would only receive a $51.00 tax break, which was less than 1% of the entire 2001 tax break. During Senator Charles Grassley’s saner days, as he currently appears to want to only impress Tea Party extremists, he was the only Republican that protested against the AMT expansion, but got shot down by his fellow Republican colleagues. Grassley argued that it was ridiculous to increase taxes on those that were never intended to be hit by the AMT while doing so to lower the taxes on those in upper incomes that the AMT was intended for, but to no avail…he lost the argument. These Bush tax cuts, not only in opinion and not only in foresight, but in hindsight now as well, have contributed to record level revenue drops since over half a century, while at the same time surging projected deficits. 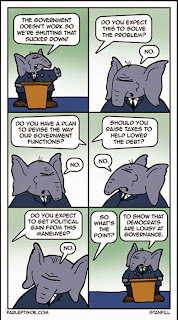 Is this the Republican answer to what “fiscal conservatism” is all about? 1982, 1983, 1984, 1985, 1986 and 1987…those are consecutive years, not numbers and do ya know what they represent? In each of those years…the semi-deity who all Republicans go to the altar to worship and pray to…raised taxes. We’re speaking of President Reagan; he indeed signed into law tax bills in six straight years. In 1982, it was The Tax Equity/Fiscal Responsibility Act and the Highway Revenue Act. 1983 saw his signature on payroll and Social Security benefits tax hikes. 1984 he signed into law the Deficit Reduction Act hitting small businesses. In 1985 Reagan signed legislation for a 16 cent permanent federal excise tax on a pack of cigarettes worth $2.4 billion a year. 1986 in the Tax Reform Act, the top income tax bracket dropped from 50% to 28%, but favored tax loopholes were closed and in 1987 Reagan signed into law the Omnibus Budget Reconciliation Act extending the telephone excise tax and eliminated real estate tax loopholes. Who can forget the famous phrase, “Read my lips…no new taxes.” That was stated by then presidential candidate H.W. Bush in 1988. Unfortunately for Republicans, H. W. Bush signed into law when he became president an across the board income tax hike that would reduce the budget in five years. He also increased the marginal tax rate, cut out exemptions on high income earners and would not reduce the capital gains tax, even under high pressure from his own party to do so. President Clinton promptly raised the top two highest income tax rates in 1993 to 36% and 39.6% and later imposed a 4.3 cent hike on transportation fuel taxes. In doing so, the nation enjoyed one sharp period of shared prosperity. No matter how Republicans boisterously, but in the shallows holler, taxes are at their lowest ratio in over 50 years, currently at 15% for a married couple filing jointly with a combined income anywhere from $17,851.00-$72,500.00. 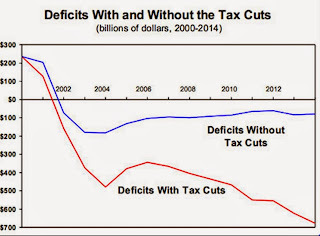 The Center on Budget and Policy Priorities chart below shows the distinction of the deficit with and without the Bush wealthy tax cuts. As far as the other self-described Republican name tags go, holding the debt ceiling hostage, to drive the country towards a fiscal cliff’s outer edge, and enact sequestration is not a very patriotic emblem to behold. Then actually threatening two times before, while on the third actually invoke the shutdown forum, is not anywhere near loyalty to country when allegiance is adhered to a party and its ideologue over a functioning government. Intervening not only into our lives, but actually inside our mothers, wives and sister’s bodies with harsh trans-vaginal required procedures and anti-abortion laws, while conferring primitive laws making a gay less human…seems to me to be literally applying government into our private rights. “We the people,” as emphatically stating government working for the common folk…forget that noise. Unless you’re a member of their select corporate/wealth elitist base…you are unknown to them until it is time again to collect your vote. Most Republicans today won’t even hold a town hall meeting, but let one of the Koch Brothers announce they may come by the office, that Republican congressman will pitch a tent and camp out there on the office floor waiting for the possible arrival. No, to defund public programs, but aggressively protect every red cent the well-off have accrued is not for the people. I have so tired of Cantor’s catchphrase of, “In the last five years SNAP (the food stamp program) has doubled.” I wish for once he would continue and explain why, instead of inferring it is loathsome bums taking advantage of tax dollars. What happened five years ago was a thing called the ‘Great Recession,’ a financial and economic crisis so big its collapse was just shy of being called a depression. The pursuing cancerous tentacles reached out and stole away millions of working families’ living incomes, pensions and savings. Most on public assistance today are families that were ravaged by the recession and actually are working, but unfortunately in low wage menial jobs. 15.9 million U.S. children live in insecure food homes today. That’s 1 in every 5 children. Even though the recession was brought on primarily as fueled by Republican deregulation policies, would they consider extending a helping hand, no ma’am. Instead, House Republicans voted to defund SNAP $39 billion in approving HR bill 3102. With a vote of 217-210, all Democrats voted against it, while at least fifteen Republicans did as well. But to growl at even mentioning touching any of the 100s of billions of taxpayer dollars spent each year in corporate welfare in the form of free land grants, free cash grants, subsidies, tax breaks, tax forgiveness and offshore accounts, it appears that for Republicans, taking away bread crumbs from the mouths of hungry babes is much more legitimate an act. Personally, I don’t engender much anger, but I get mildly perturbed in even writing this. I literally detest the mindset of today’s Republicanism. The corporate conservative ‘American Legislative Exchange Council,’ otherwise known as ALEC, mandated and pushed voter suppression laws disguised as Voter ID are solely intended to aggravate, intimidate and frustrate the American voter that is perceived by the GOP to lean Democrat at the polls. ALEC originally could not push its legislation through the federal level, so went a notch lower to state governments and in particular the red states. The ploy has long now been exposed. These laws have nothing to do in countering mass voter fraud that is nonexistent. But the politically blinded will still stress so; even argue what’s wrong with getting a photo ID. Well, perhaps they've never been bed ridden, very elderly, have no means of transportation, have a photo ID but the state won’t accept it, such as a state university student photo ID as issued out by that very same state. What, these red states don’t trust their own issued student cards? Perhaps these blind folk have forgotten voting is the most basic fundamental right the founding fathers offered to each and every American and that the right to vote should be accommodated…not thwarted. As the GOP dominant state legislature did in Wisconsin, what does moving voting registration facilities from Democrat leaning districts to heavy Republican districts have to do with combating voter fraud? How does cutting short or attempts to entirely do away with early voting in numerous red states combat voter fraud? It does not, but the GOP pays attention to statistics and analysis states early voting is preferred by minorities. Though the red states’ new Voter ID laws have been highly and favorably reviewed by Fox News, the broadcasting channel has kept silent on the lack of any voter fraud found. Fox News has not only kept silent, the TV station is emblematic of the three deaf, dumb and blind chimpanzees on what voter fraud laws have revealed. Voter fraud as of late has actually been committed by Republicans. Among others, Republican New Hampshire senate majority leader Jeb Bradley’s son voted twice in two different states in the 2012 presidential election. GOPer, Adam Ward in Virginia was convicted recently on 36 counts of voter fraud. In Massachusetts, Republican Jack Villamaino was just convicted and jailed for changing 300 Democrat votes to Republican in his bid for a state House seat. Study the chart above for it is what leads us into our discussion. What it graphs is debt ceilings. 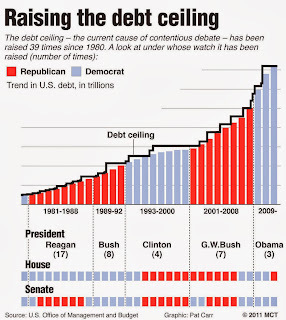 The U.S. government has a debt ceiling increase debate coming up in a couple more weeks. In addition to the ongoing Republican induced government shutdown, this could actually cripple the country if Republicans behave any more belligerently as they have been. If the GOP demands another Obamacare or Social Security and Medicare defunding and if that demand isn’t met they then will not increase the debt ceiling; this nation will go into default losing global marketplace shares. This could possibly bring China and Japan, who own around 20% of U.S. debt, to the brink of dumping all the two countries’ U.S. debt holdings. In turn this would create volatile upheavals in the marketplace and send inflation skyrocketing. China this past June has already reduced its treasury U.S. debt holdings down to $1.2758 trillion and Japan has trimmed its holdings recently to $1.0834 trillion for the third straight month. This scenario won’t likely happen, but they aren’t dealing directly with Tea Party threats and demands yet. Listen, it’s so simple that a simpleton can grasp, the ones to blame for the government shutdown are the ones who brought it to the table in the first place unless all their demands were met. Now, it was not the Democrats that did that...it certainly was not Obama...it was Republicans period. They introduced it and in this case implemented it when their callous demands were not met. The government shutdown was not automatic if a budget agreement could not be reached. It was introduced by Republicans as a threat to install unless all their demands are met. 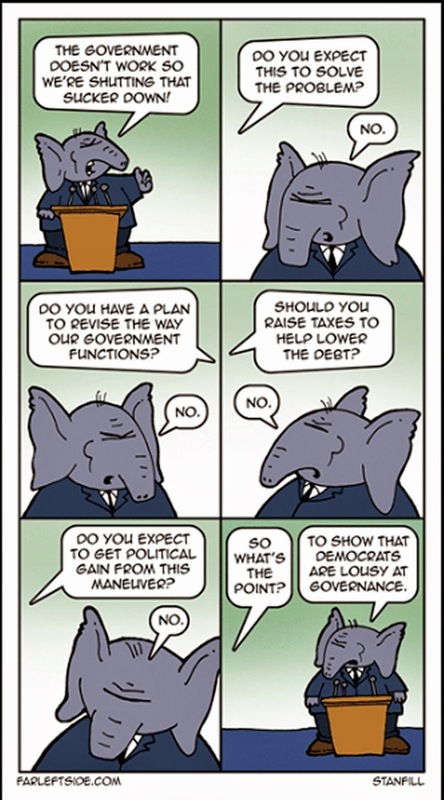 The same will occur with the coming debt ceiling negotiations. In a closed door Republican session last week, who was it who applauded, even cheered when Boehner announced he was going to implement the shutdown threat unless the ACA was defunded…the Republicans…actually got all giddy…gleeful even over shutting down the U.S. government. They believed that was a big victory. In fact there are unconfirmed media reports that some of the attending Republicans had alcohol on their breaths as they were exiting the conference. The stories though, were corroborated by Representative Alan Grayson (D-FL) who elaborated that not only this time, but he had also smelled alcohol on the breaths of Republicans exiting a few other past Republican only conferences. Jihadists are the Teahadists biggest fans. Osama bin-Laden wherever his wretched soul may be is praising Allah right now for crashing down on Earth the gift of the Republican Party. Republicans have just conducted an act all terrorists are so envious of; for no matter how hard the jihadist tried, results were merely vain attempts. No, terrorists could never do themselves what Republicans just accomplished and that is…shutdown the U.S. government. Republicans in debating and speech stumps always defer the ACA as a bill…it is not…it is the law…The GOP know this, but to further add confusion, the GOP downplays and demeans the law. Folks are so confused by the flood of Republican misinformation that they don’t even know that the Affordable Care Act (ACA) and Obamacare are one and the same. All polls show a majority of conservatives are more than willing to accept ACA when healthcare is presented with that name, but flat out refusing the new healthcare law when it is presented as Obamacare. Kentucky, where the vast majority of Republican Kentuckians absolutely refuse ‘Obamacare,’ the state has been inundated with the flood of people signing up for ‘Kynect’…which is guess what…Obamacare under another assumed name. I’m going to repeat myself some here in the next few paragraphs, but I’m trying to imprint my point. Republicans are the experts in the mastery of excreting bad deeds then laying blame pointing fingers in every direction but where they stand when the expected flinging feces hits the fan. Republicans comfortably are able to put blame on the shoulders of those who actually were against it. Deregulation policies...a Republican mandate that was the fuel for the financial crisis and resulting ‘Great Recession’...with the resultant economic and unemployed fallout along with a record high national debt and deficit that came with it...Republicans squarely accused the Obama administration washing their hands of it. Debt ceiling hostage taking, fiscal cliff brinkmanship and sequestration...all born from Republican pushes, but still, they publicly lay blame on the sordid results on everyone else but themselves, while privately patting each other on the back and cheering on the gloom that they have created like the sequestration snaking its way into government programs’ budgets. Republicans, in extending their mastery of deceit, after deciding not to vote on the so-called ‘clean’ clear resolution (CR), the House Rules Committee just met deciding on a rule to do just that. This allowed Majority Leader Eric Cantor to request a conference with the Senate. The House later voted to go to conference with the Senate by a 228-199 vote. The senate flat-out rejected it putting the ball back in the GOPs House. Of course the Democrat senate majority won’t accept a conference…“not with a gun to our head” as majority leader Harry Reid put it. The point is the Republican House majority refused eighteen times before to go to conference with the senate. They absolutely would not steer from any of their demands. Now, at the last hour, they decide a conference committee might be a wise move after all, but not for the right reasoning. No, it wasn’t to negotiate and come to compromise in keeping the government open. It was merely a gambit to lay blame on the Democrats as so poignantly portrayed by a GOP anonymous leadership aide when he stated after the senate’s refusal to ‘Business Insider’ (a business and technology news website) that, “It’s regular order. It means we’re the reasonable, responsible actors trying to keep the process alive as the clock ticks past midnight, despite Washington Democrats’ refusal — thus far — to negotiate.” Now can ya imagine that…but once again Republicans blaming Democrats for the GOPs own actions. Do you see the ploy here? Allow me to paraphrase the situation in a very simple parallel. OK, I come into your home with a pail of mud, then I plop the pail on the table where a meal has already been prepared and set. I say to you, if you don’t meet my ridiculous demands that would harm folks; I’m going to pour this pail of mud onto the tabletop. You still refuse, so I give you one more chance to meet my demands in a disguise. Still, you again refuse. I proceed to pour the mud onto the tabletop. Your spouse comes in, sees the mess and then has a hissy fit. In the angry atmosphere, I point the finger blaming you for the mess. The fact is, not only the public, but Fox News knows the blame lays squarely on the GOPs shoulders. The very next day after the shutdown implementation, this was exemplified by all Fox News shows expressing the shutdown wasn’t so big a deal after all in their kicking out the spin wars. Well, if it doesn’t affect Hannity any…I reckon it’s OK. He is correct; there have been seventeen shutdowns before, but much unlike this eighteenth one, never when the country has been in duress with a slow recessional economic recovery harboring additional sequester cuts. Yeah, never mind that 800,000 folks will be furloughed without pay and those federal workers that remain will see delays in paychecks for work and services rendered. The bare minimum Social Security (SS) workers will stay on to ensure the checks are sent out, but if any other SS transactions or business needs to be conducted, forget it. IRS tax refunds will be suspended, so it appears Hannity already received his return. He most likely doesn’t work on a farm or have a small business as all loan processing for farmers and small businesses have been suspended. Of course the closing of the Department of Veteran Affairs, veteran’s administration benefits certainly don’t pertain to Hannity. Speaking of our Veterans, just after the Republican self-induced shutdown got up and rolling locking the gates to all the national parks and memorials, did you see those Republicans charging in towards the Veterans Memorial in order to showboat and grandstand with a group of senior WW II vets who at first were denied entry. Seeing a good chance to get photo-ops in using the vets for stage props, Republican congressmen, led in the charge by Representative Michelle Bachmann came lumbering down to the memorial to rescue these stranded vets. Too late, regardless of false initial conservative reports, the Republicans did not tear down the gates allowing the veterans access, portrayed as if Obama himself was standing right in front of the gates blocking entry. What really happened was the security guards had already went ahead and let the veterans in to honor their fellow fallen soldiers. Anyway, to make the best of it Bachmann got her smiling face inoculated into photos taken beside vets in wheelchairs to show her false pride in our veterans and inglorious patriotism to nation. This is tinfoil strategy to its apogee. Portraying themselves as if they’d come to the rescue of these vets to experience the memorial when it was their GOP actions that threatened them not to. Shutting down national monuments, memorials and national parks for all Americans to feel a connection isn’t the brightest way to express patriotism. Chairman of the Republican National Committee (RNC), Reince Priebus also saw an opportunity in damage control and hot-dogging, so went to the memorial to mingle amongst the senior veterans then proclaim on the Veterans Memorial grounds that the Republican Party will cut a check to keep the memorial open…now imagine that…what such a kind heart and genuine gesture to do among all the cameras and tape rolling. After all that political sweating, Reince probably needed a rinse. Every vote in the House was not strictly Republican in pushing forward the shutdown; nine Democrats voted for the ACA repeal attachment. They were Krystyn Sinema (AZ), Ron Barber (AZ), John Barrow (GA), Steven Horsford (NV), Dan Maffei (NY), Sean Patrick Maloney (NY), Jim Matheson (UT), Mike McIntyre (NC) and Raul Ruiz (CA). I am all for compromise…that is what the issue here is all about, but complimenting a demand to attach an ‘amendment’ on a pending budget ‘bill’ that will defund a ‘law’ intended for the health and wellbeing for all of America’s citizens, I find merely political in nature concerned more about votes back in the district than voting an ethical conscience. There were quite a few Republicans as well wanting to back track or walk away from the ACA defund demand, but again the reason was political and not at all based on ethics. They were more concerned on how the shutdown would negatively affect their party as opposed to how it would negatively affect human lives without the ACA. It is refreshing seeing that a few Republicans like Nunes are gaining some semblance of reason, but what I don’t like about this is their justification in revolting against their hardliner colleagues. Well, since just voting to proceed ahead full steam delivering their ultimatum back to the senate...indeed for the sake of the nation...with the slew of Republican assaults from debt ceiling hostage taking, fiscal cliff brinkmanship, 586 filibuster calls to sequestration and now turning the third shutdown threat into reality...the process of dysfunction is about the only function Republicans seem capable of in performing. The irony to all this is that Republicans can’t even afford to defund Obamacare. Oh, they’ll shutdown the government as a decoy, but that stunt can’t last forever. Ya see, the budget hatched out from the Republican House plan this past March has ACA funding sources included in it. Without those, the budget tanks, so let’s explain. Hundreds of billions of dollars in ACA revenues and Medicare savings from the law have been incorporated into the new budget by the Republican House to balance it. Representative Chris Van Hollen (D-MD) point blank explains in an opt-ed titled, ‘Stop the Anti-Obamacare Hypocrisy’ that the budget, authored by Representative Paul Ryan (R-WI) includes all these ACA revenue and Medicare savings in his budget bill amounting to $700 billion and another $145 billion in the last year under this budget. This is the only way the budget is balanced. All House Republicans know this and all House Republicans voted for it. As far as offering up a last minute amendment to repeal the medical device tax, they too know that is a phony stunt as this added tax revenue is also included in the Republican budget amounting to $1 trillion dollars over the next decade with another $174 billion in the tenth year. To defund Obamacare or even repeal the medical device tax is budgetary suicide. The boxed-in corner Republicans have put themselves into, to escape they thought the rat hole in the corner’s wall was big enough to crawl out of, but it wound up being a little mouse hole too small to squeeze through. As Obama put it in a speech last week, shutting down government is not a choice to use as ransom in passing budgets…it’s their job. That Ted Cruz is something else isn’t he…a true Joe McCarthy reincarnate darling among Tea Party people. Yet as for most Republicans today, he has a platform with no support in standing. What good is a platform if ya can’t stand on it? Judging from the photo above of a Cruz rally outside the senate supporting him during his ongoing fake filibuster, it simply appears that’s a fair representation of the Tea Party’s minority ranking. We all know the Tea Party is a minority political cult...they simply have big mouths that hurl loud insults and that gets all the attention they garner. We all know Cruz caters to that minority, but what we now know is that support for Cruz is ever minor even in the minority. The majority of voters did not vote Republican in all three branches. Obama was reelected, the Democrat majority senate was maintained and strengthened and the House lost Republicans while adding Democrats. The three branches have one-third Republican majority and that is the House of Representatives where states’ districts have been heavily gerrymandered favoring Republicans. Within the Republican House there is even divided a smaller third of TP politicians. In this case, TP stands for Tea Party which could be easily confused with toilet paper. Following this line of thought even further, there no longer is one Tea Party, for it has rifted into split factions. 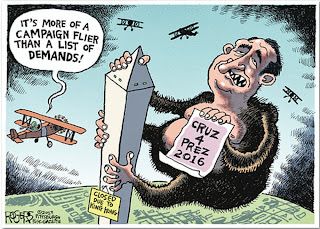 This Cruz bogus TP lackluster showmanship was not even a ‘quasi filibuster,’ it was merely a charade. The whole event was planned out beforehand, reading Dr. Seuss is not staying on topic and for his cohort Senator Lee to lob him asinine questions like, “Where did Chinese gooseberries originally come from? How long did the Hundred Years’ War last,” and, “What color is the purple finch”...to give Cruz a break from his mind numbing oratory is simply hogwash. Adult pretenders like this don’t belong in congressional halls obstructing public legislation...they belong in padded jail cells away from the public. Some conservatives actually complained that there was nowhere near the media attention for Cruz as there was for Texas state Senator Wendy Davis’ filibuster. The reason why is simply because there was nothing to compare in the two events. Cruz read from Dr. Seuss, took breaks, even filibustered an enacted law for cryin’ out loud, while ‘corner guy’ stole his thunder. Ms. Davis had to continuously be on topic, could not take a break, was filibustering a bill, not a law and supporters raised her thunder to an inaudible level. Cruz sat down on breaks and was asked stupid dumb idiot questions by his cohort Senator Lee. Ms. Davis could not sit, could not even lean her arms against a desk top and could not carry on a conversation with anyone. 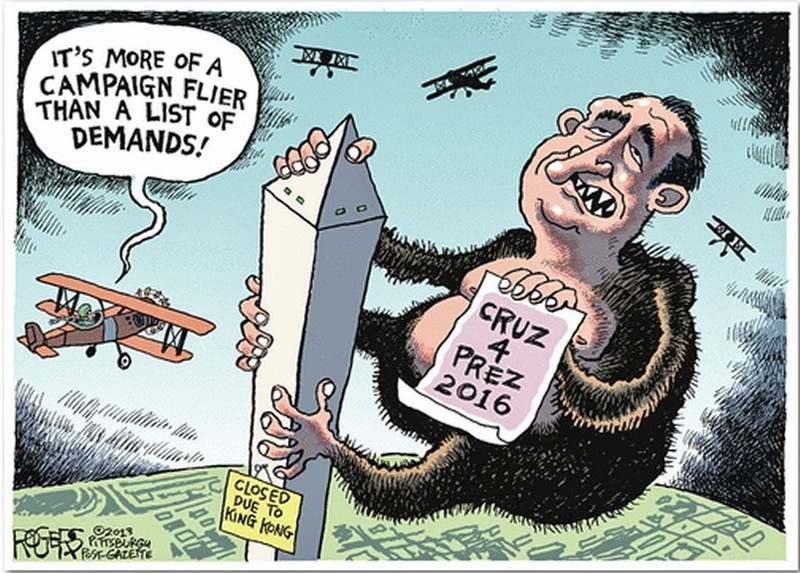 Again, Cruz did not filibuster he displayed a pantomime while the senate went to vote. Davis filibustered holding off a vote to enact a bill into law, until Perry called for a special session without filibuster permitting. The Dr. Seuss book by the way was ‘Green Eggs and Ham’ a story about complaining of something before you taste it. Once tasted though, you like it. Now isn’t that an ironical twist in reading that while he’s actually trying to defund Obamacare before its full inauguration. Cruz’ alleged secret meeting with Republican House members telling them they need to buck protocol and oppose their leadership, gave him a bit of political spin as indeed some of his allies in the House did confront Boehner pushing him to defund the ACA law in its entirety, if there were to be any kind of budget passed. This quickly faded though once Cruz realized getting the senate on board was futile and his rising popularity balloon suddenly ran into some pine needles. All it did was make Boehner even look smaller than he already is. In challenging his own leadership, Boehner should have confronted Cruz and tell him to get the Hades out of my House and go back from whence ya came from. He did not; could not even find the gumption to. Conservative consummate, Grover Norquist, the author, purveyor and enforcer of the congressional anti-tax pledge in an interview with freelance columnist Ezra Klein published this past October 2nd, had this to say about Cruz and the shutdown. Uh-uh…not in my books. Obama’s been playing bipartisan politics his whole tenure with the Republicans and they have only treated it as a sign of weakness. It is time for him to quit ‘playing politics’ and stand firm on principle. It was quite worth a chuckle or two though, listening to one despicable Republican bash another despicable Republican for being just that…despicable. As his grandstanding filibuster escapade was a ruse for presidential campaign funding…indeed if Cruz does win the general GOP presidential candidacy, I surely hope these TP folks do realize when they all scamper to be the first in line to pull the voting booth lever for Cruz, no birthers will have to make-up any foreign born stories here…for Cruz undeniably is foreign born. Then we’ll all actually see who’s more than willing to unconstitutionally vote for a foreigner or not. Who knows the number of lies Cruz stated in his 21 hour oration, but one stung him good. Cruz by name referred to a college student in his quest in attacking Obamacare. Being labeled by Cruz as a precautionary tale of Obamacare atrocities, the Rutgers University student, John Connelly lashed out at Cruz on an MSNBC Ed Shultz program. Along with that and incessantly mentioning single moms as waitresses throughout his oratory, it goes to show that a lecturing smiling face can often drift from truth. Cruz and his cohort Lee, who I am appeased to refer to as ‘Dumb and Dumber,’ decided to start a promotion in impeaching Obama. Both could not find any worthwhile evidence or support for the cause and the scheme quickly wilted away. I would sorely wish that there was a law for impeaching lawmakers that falsely attempt to set up frivolous impeachment proceedings just because they don’t like a fellow politician. Perry said this on the same day 2.8 million folks first began signing up for Obamacare (actually overloading the system) while he was stumping for New Jersey GOP senate candidate Steve Lonegan. Not to be too surprised, for Perry also thinks that Chairman of the Federal Reserves, Ben Bernake, (who also is a Republican, but one who happens to be working under Obama), is guilty of treason. I say the only criminal act is Perry’s misleading feint. That’s right; in closing down the government the Republican House just shuttered their staunchest right-wing voting base by closing the doors on national parks. The Klu Klux Klan had reserved a section in the Gettysburg National Military Park to have a rally on October the fifth. It had to be cancelled. Here is something even more funnily with an added delightful touch. The latest conservative Fox News polls show a disapproval rating of the Republican Party since the shutdown at 59%. Support for repealing Obamacare has dropped from June’s result of 39% to today at 30%. In this game of Republican ping pong politics, was the shutdown really necessary? As Stutzman alludes to and Nunes flat out expressed, no it wasn’t. 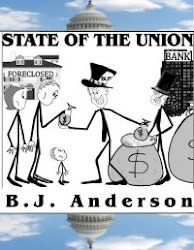 Congress has one key duty in the Constitution…pass spending bills that fund the government. Not to shut it down or make it dysfunctional. Nah, only when it fits their rhetorical narrative...they aren’t incessantly sabotaging Obamacare to the point of further damaging the nation in a government shutdown because they think it might be a failure...no, it’s because Republicans are so fearful of the law’s success. Republicans hollered all the way through Social Security legislation that it would turn the nation into a socialist state. It didn’t, but it certainly pulled over half of the nation’s seniors out of dire poverty. That was strike one. Again they screamed all the way through Medicare legislation expressing it would turn the country into socialism. Even had an actor back then known as Ronald Reagan give TV ads saying it would do so. It didn’t, but wound up being the soundest program this country has ever come up with. That’s strike two. So ya see, Republicans aren’t afraid of the ACA as being a failed law for the nation, they are literally fearful of its success in pointing them out like string beans in a carrot bunch. As toddlers walking the halls of congress Republicans are so in action and antic. To pay for the public option, the two taxes in #4&#5 could surely cover it. Demand for product and services rises exponentially with a more livable wage scale and banks/financial institutions would no longer be rolling dice to make huge temporary currency scores with everyone else’s money. This couldn’t be much simpler and to the point, but are Republicans truly willing to mutually be conciliatory, or remain demanding? Exactly what does that mean...that she is so tough or that she is so ignorantly stupid? This is not a game...this is about throwing America’s prestige down the sewer pipe. 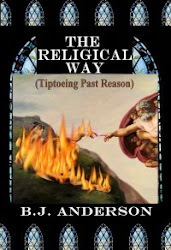 This is all about Osama bin-Laden in his watery grave shouting praise be to Allah for the gift of Republicanism in shutting down the U.S. government...something bin-Laden always strived to do but never could. Name any policy of regulation, immigration, Global Warming, the environment, jobs, feeding the hungry mouths of babes, gun control, taxing the rich, the ACA Law or Voter ID laws and there you will find that facts do not matter with Republicans as they will throw doubt, deceit and misinformation into their prevailing ignorant winds. I, as one Independent indeed do hope the shutdown not only hurts the party...I would like to see it turn them into a footnote in the American history books...for this is not only a GOP self-destruction...they’re dragging the nation down with it. 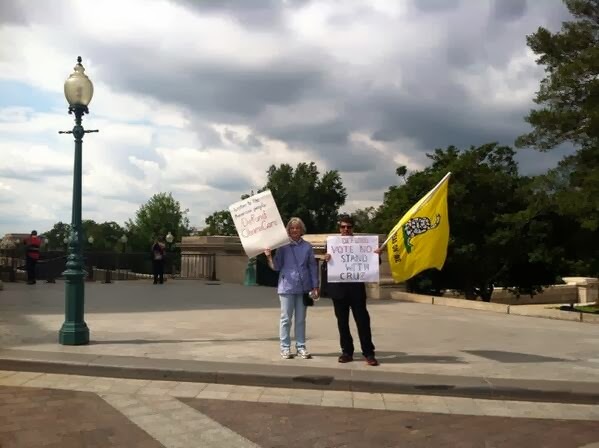 “Tea Party voters are a pretty self-assured lot. They’re 100 percent certain that if they stand by conservative principles (as they define them), scorning any compromises, a minority can rule the world. Obamacare is a law. It was passed by both houses of Congress, and signed by a president. And this president, having been comfortably re-elected last year, remains in office, veto pen at the ready. The law was found to be constitutional by the Supreme Court, which has a conservative chief justice and four other conservative jurists. Repealing it will require more than a determined minority. It will take a Republican majority in both houses of Congress, and almost certainly a Republican president. The Democrats who now control the Senate certainly won’t pass the House bill. They’ll strip all Obamacare-related provisions from it. If Senate Republicans successfully filibuster the bill, Harry Reid will let the whole thing die and the government will shut down. Why? Because, T Party members, you don’t have the numbers to prevail. You’re a minority. You’re a minority in Congress and you’re a minority in the country. 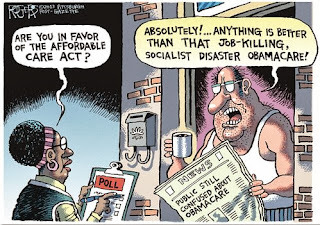 A majority of Americans might tell pollsters they don’t like Obamacare, but guess what? They like the idea of shutting down government even less, as every recent survey has shown. And they’ll blame Republicans for it…and make them pay for it. You’ll give a needed boost to the president’s flagging popularity and diminish the Republican brand, which really can’t take much more diminishing. And you’ll delay the day when you might conceivably have the numbers to repeal Obamacare because you’ll have made it a lot harder to elect a Senate majority in 2014. But you’ll have stood by your conservative principles even to the point of sacrificing the prospects for their success. That is a Republican telling the truth about the T Party and internal GOP strife.